FORT WORTH, TX. November 5, 2007 – HTA Aviation, LP, a privately held woman owned small business entity provides training on our new test and support equipment to the DCANG 201st technicians. “To continue our commitment to provide the most advanced test and support equipment for the C-38 Program, HTA Aviation purchased additional test and support equipment.” said Bill Simpson, C-38 Program Manager for HTA Aviation. The Fuel Status Simulator Test Set is a self contained unit designed to assist with fuel quantity and flow rate system tests and diagnostics. This tester is utilized with the Aircraft Maintenance Manual procedures, tables, figures, and charts along with the current Wiring Diagram Manual. 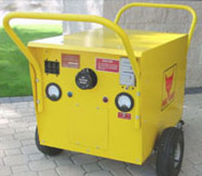 The Simulator monitors all power, fuel probe and signal inputs used by the fuel management indicating system and the output signals that the system generates. Fuel system inputs and outputs may be isolated and simulated to the component level thus enabling the technician to troubleshoot and check the system for operational accuracy and integrity. 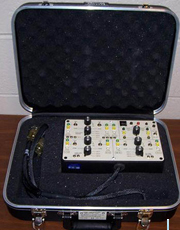 This test set requires an approved fuel system capacitance tester and the flow rate tests require an approved audio oscillator and frequency counter to be connected to the Test Set. This Fuel Status Simulator Test Set has no active components and does not require periodic calibration. The Cabin Temperature Test/Simulator Set P/N 2160 monitors all power, sensor, and temperature selector inputs used by the cabin controller and also the output control power to the refrigeration bypass valve. Each Sensor, control and bypass valve may be independently isolated and tested from the simulator. The temperature controller can be tested for operational integrity by isolating the sensor inputs from the aircraft and simulating them. 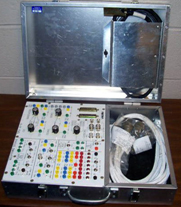 The use of this test set greatly reduces the number of parts changed in an attempt to rectify many temperature related problems, such as temperature sensors that have been known to fail in small temperature ranges but appear to work OK during resistance checks and/or operational testing on the ground. HTA Aviation, LLC, a privately held company, providing superior CLS and COMBS services for our government and support for some of the world's most technologically advanced business jet aircraft. HTA also offers Service Engineering, Technical Publications, and Consulting Services for the business aviation industry.